Within Teamwork Projects, you can generate a range of different reports across all areas of your project. The project report is available from the Overview section of your project. 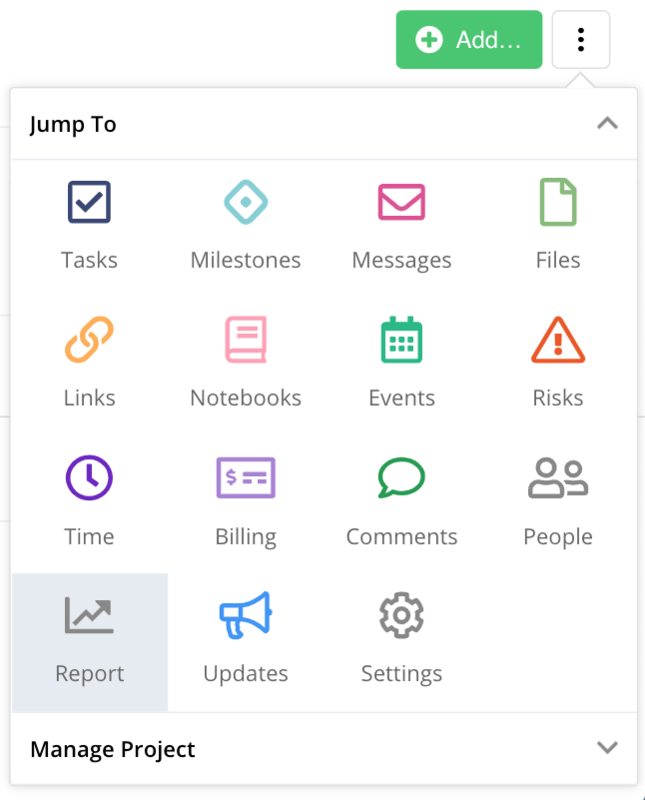 Click the options (three dots) button near the top right, and select Report from the Jump To tab. The project report is designed to give you an overview of all items within your project, including milestones, task lists and tasks. Task lists associated with a milestone will be grouped together. Tasks - You will see the task name, description, start date, due date, assigned, date created, priority progress, status, estimated time, logged time, billable time. Tasks are colour coded to indicate if the item is completed, active or late. The project report can be exported as a PDF. In the project's Overview section, you can also export a copy of all activity on the project. At the bottom of the Activity tab, you will see an option to export all to Excel. The activity export is a report listing all the activity happening across items on your project, that you can see in the Overview tab. 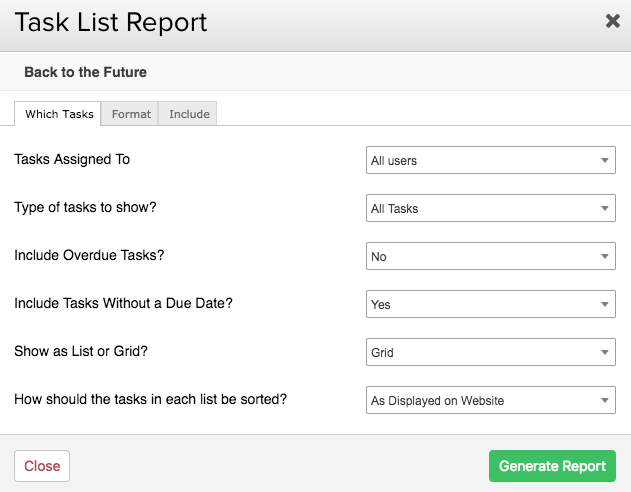 You can create a report of all task lists in your project. 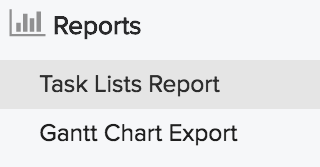 In the Tasks area of your project, you will see a Reports section in the left pane, with an option for a Task Lists Report. You can then select what you want to be included in the report. You can export the report in PDF or Excel format. 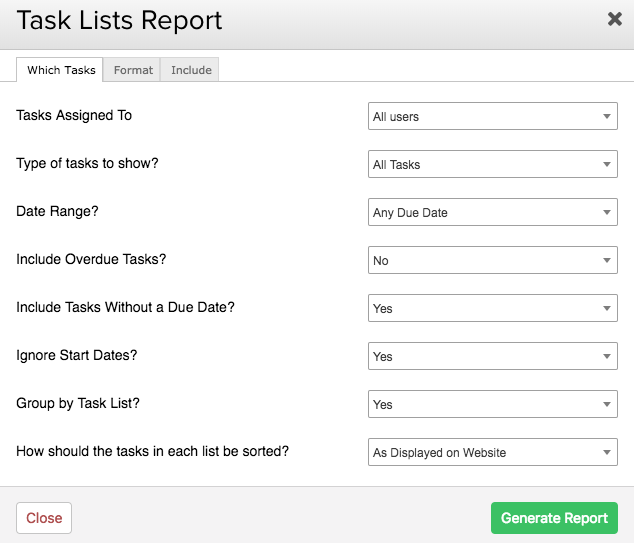 Within your project, you can generate a report of all tasks in a particular task list. Click the dropdown to the left of the task list's name. 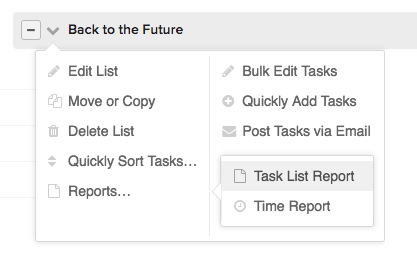 Hover over Reports and you will see the Task List Report option. 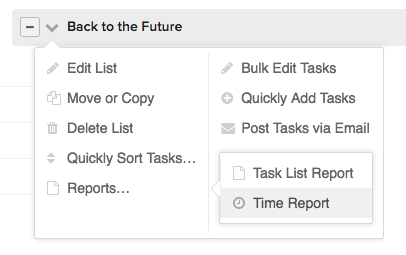 The Task List Time Report shows how much time has been estimated and logged on tasks in the specific task list. Click the dropdown to the left of the task list's name. Hover over Reports and you will see the Time Report option. 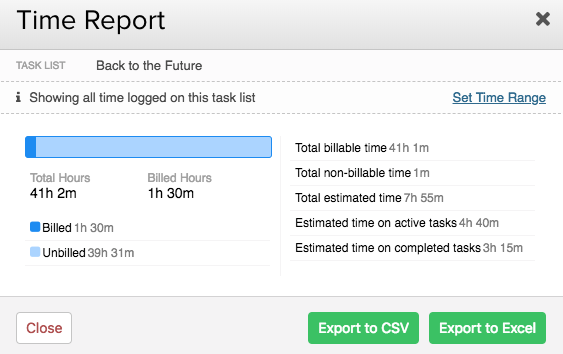 The Task List Time Report can be exported to CSV or Excel. You can generate a printable version of an individual task in your project, which will include all time logged, comments and activity for the task. In the Tasks area of your project, click on the task's name to open the task details page. From there, click the Options (three dots) button and select Printable Version from the dropdown menu. You can choose PDF or HTML for the printable version. In your project's Time tab, you can generate a report of all time entries for your project. Click the options (three dots) button in the top right corner. Hover over Export in the dropdown, and you will see the export options. If you have filters applied in the Time area before exporting, only those items will be included in the report. Date, project, who logged time, description, tags, attached task list, start/end time, billable, billed, time taken, hours taken, estimated time. You can export the report to Excel, PDF or CSV. You can generate a report for the milestones on your project. Click the Options button near the top right corner of the list in the Milestones tab. Hover over Export and you will see the export options. You can use the advanced filters in the Milestones tab to first filter what you want to include in the export. Excel file exports a list of all Milestones and their details. iCal feed creates a Webcal link which you can add to your external calendar so that Milestones from this project will appear in your external calendar. Note: The milestone report can also be generated for your archived projects. A risk register is where you plan what your response will be if a risk materialises into an actual issue. Click the options (three dots) button near the top right of your project's Risks tab. Hover over Export to see the export options available. You can use the advanced filters in the Risks tab to first filter what you want to include in the export. You can export the Risks Report to Excel and PDF. You can export a list of links from your project. 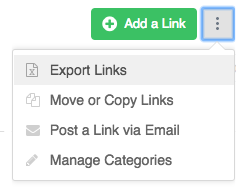 You can choose to export all links from the project, or from a particular category you have created. Click the options (three dots) button near the top right of your project's Links tab, and select Export Links from the dropdown menu. The Links report can be exported to Excel. In the project's People tab, click the options (three dots) button in the top right, and select Export to Excel from the dropdown menu. The people report can be exported to Excel.